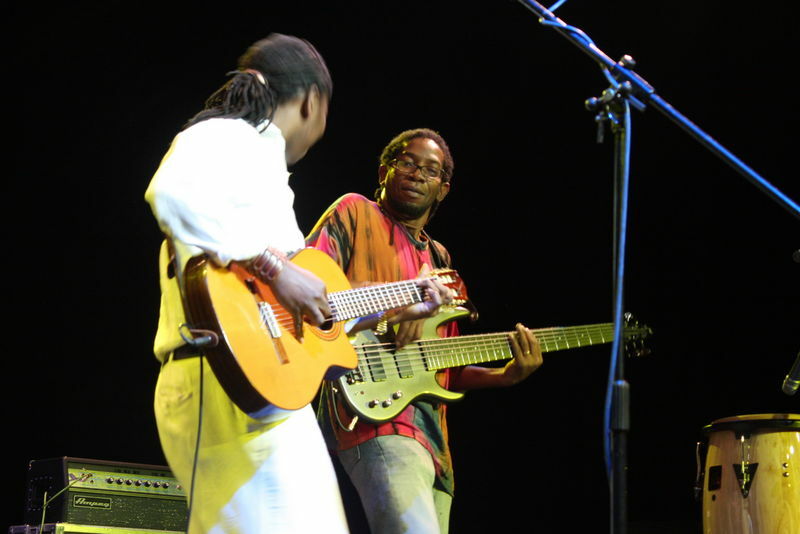 The Garifuna can certainly be said to punch above their weight on the world music scene. For a relatively small community born out of the accidental shipwrecking in 1635 of the slave ship they were on, their subsequent intermixing with the now extinct communities of Arawaks and Caribs on the island of San Vincent, their wars against the British and French, their forced relocation to another Caribbean island, Roatán and their eventual escape from there and settlement on the coast of Central America (spread over what are now the four separate countries of Honduras, Nicaragua, Guatemala and Belize), this is one community who know what it is to survive and constantly reinvent themselves, without losing the essence of their unique identity. 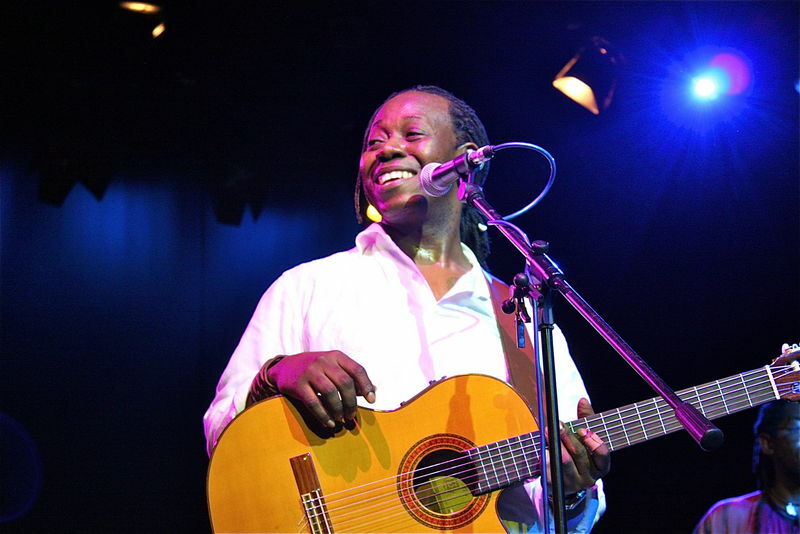 Currently at the forefront of this is the Honduran-resident Garifuna, Aurelio Martínez, who is seemingly single-handedly blazing a trail to bring Garifuna music, language, culture, history and identity to the rest of the world. Obviously Aurelio acknowledges he is a product of all those who went before, from the late Andy Palacio and the punta and paranda renaissance of the 80s and 90s right back to his ancestors the Caribs and Arawaks and the Mokka/Ibibio ethnic groups from what is now south-east Nigeria. However, as we speak, it’s Aurelio who is carrying the flaming torch to reignite interest in, and cast light on, this long-hidden culture. 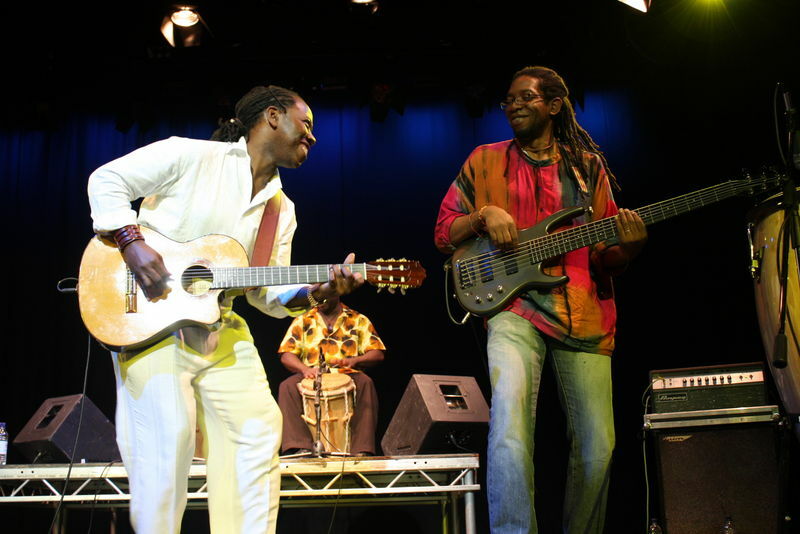 Aurelio’s music although incorporating relatively modern instruments such as acoustic, electric and bass guitars, is grounded in two things in particular: firstly the Garifuna drums and various hand-percussion (siseras, clave, congas) and secondly the Garifuna language itself. And it is with this melding of ancient and modern that Aurelio has made a success of his art. This is fusion music from a community grown out of three originally separate but now fused cultures - and yet its authenticity and identity is never in doubt. That throbbing percussion, that strange language and that confidence in who they are comes through loud and clear on stage and their albums. This is Garifuna. However, when I first came across this music and culture (around the time of Palacio’s “Wátina” album in 2007), it didn’t speak to me, I felt unable to forge any kind of bonds with it. This is no comment on the music itself, more about me being not ready to approach this genre yet. A year later (Palacio having died unexpectedly from a combination of stroke and heart attack in Jan 2008) I saw Aurelio Martinez perform at the Womex world music exposition in Seville, to a world music scene still adjusting to the vacuum left by Palacio’s death. Aurelio had released his first album “Garifuna Soul” on Belize’s Stonetree Records and with that had planted his flag on the world stage. That first album generated some good press and served as a useful calling card that the Garinagu (plural of Garifuna) were in town. "a musician and spokesman of some stature"
Three years on and Aurelio seems to be finally coming into his own as a musician and spokesman of some stature, with an appearance at this year’s Womad and a new album recorded with the collaboration of Youssou Ndour (and many other great West African musicians) after Youssou chose Aurelio to mentor as his protégé following a fiercely fought international competition. The new album which grew out of that mentorship, “Laru Beya”, is confident, rounded and fizzing with energy. I began to find my way into the Garifuna world. And so I found myself in the rather sterile environment of a seated theatre at Birmingham’s newly refurbished arts centre, mac. The audience could have been more, but was respectable enough considering Garifuna music is not in the forefront of most people’s minds, although considering he played Womad earlier on this summer, I was a little surprised. Still, times are tough and the people in the half-full theatre were certainly looking forward to a good night. "a full, rich sonic landscape"
Aurelio’s band Garifuna Soul came on stage first (bass guitar, electric guitar, two hand-drummers and a hand-percussionist) and finally Aurelio himself, dressed head to toe in white, his locks tied back behind his head. 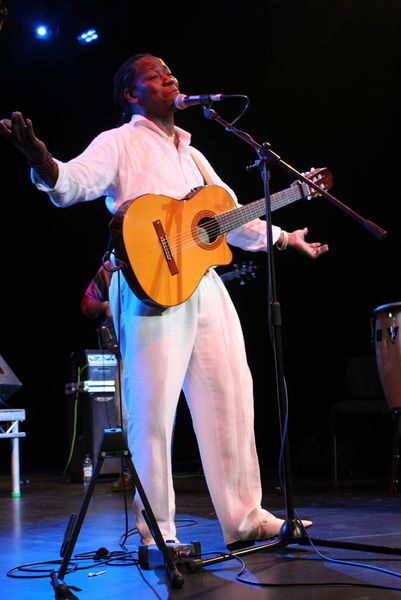 The band launched into a sprightly number, “Yange” (en elegy to Aurelio’s brother), started off by Rolando “Chichiman” Sosa (dressed head to toe in black with a little black leather fedora with just a few small feathers in the side for colour) dancing around the centre of the stage waving his siseras (like large maracas) like a shaman clearing the theatre of bad spirits. Throughout the night Chichiman held the band together via his claves and siseras, providing a peg for the rest of the band to hang their rhythms off. "a storming piece, fast, powerful and energetic." Having settled in with this first number they put their pedal to the metal and drove off into a storming piece, fast, powerful and energetic. I was struck by the sound of the band: only six musicians but a full, rich sonic landscape. The audience sat there and soaked it up, but the theatre was raked in such a way that there was almost no room to dance since the seats plunged down in one big fall all the way to just in front of the stage, where there was a pit in the ground with another three or so rows of seats. The romantic love song that followed, “Bisie-nu”, had a laid-back, lilting feel over a rolling gait in clave de son rhythm and sounded almost Hawaian at times. This was followed by “Dügü”, a track from his first album (“Garifuna Soul”), based on the highly sacred spiritual ceremonies of the Garifuna. This took the band off in a different direction musically - sort of Africa meets Country & Western in 2/4 time! Aurelio starting dancing around doing solo zapateo (fancy footwork common to many latin american countries) to the hand-drums and with much bum-wriggling (appreciated by many of the females in the audience) followed by Chichiman afterwards. Definitely one for the ladies! There were some lovely guitar solos from Aurelio’s acoustic (in a finger picking latin style) and some wonderful and very tasty work from Guayo’s electric guitar. In fact Eduardo “Guayo” Cedeño was one of the revelations of the night to me - a very inventive guitarist, full of ideas and innovation, spilling out of his guitar as fast as thought. He also reminded me of a little bull, with his stocky body, head down, and guitar protruding like a horn! 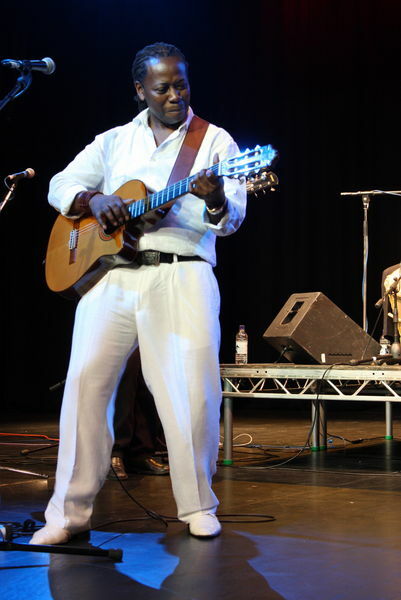 This was the band’s first time in the UK so Aurelio was keen to know whether his British audience knew anything about the Garifuna; he then took the opportunity to educate the audience a bit about this culture, apologising for his English which he hasn’t been learning long. In particular he spoke about something close to his heart: the corruption of politicians. Given that he was the first black person to become a Congressman in the National Congress of Honduras this was something he had witnessed first hand over four years in which he dedicated himself to representing his minority community and gave up music. Aurelio described how leaders often come to power, promising everything and then forget all about the people who voted them in once they are installed in power. This nicely set up the next tune, a long, laid back number, almost lazy in it’s delivery and yet the message it carried was damning enough. Aurelio declaimed in Spanish about children around the world not being cared for, children waiting to be fed and looked after, children hungry and dying especially the children of Somalia and Haiti. “Where are the leaders now?” Where indeed. It featured another beautiful electric guitar solo from Guayo who combined a sweet, sweet sound with very soulful licks and tender use of the whammy bar. 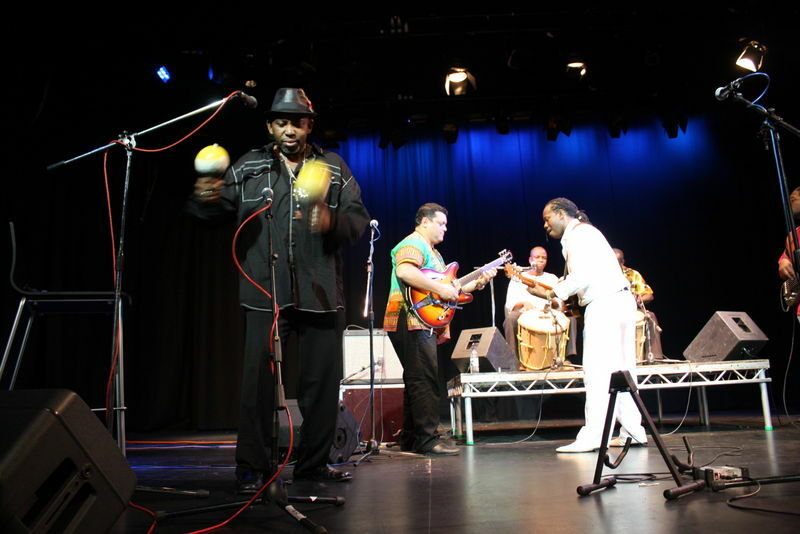 Aurelio was also featured playing a low key solo on congas which still managed to run rings around the beat, pushing and pulling it, tickling and slapping the rhythm and then entering into a percussive dialogue with the two Garifuna drummers. Aurelio’s voice and that of the backing vocalists (Chichiman and Angel) repeated the phrase “Compá” again and again, building it up and up. It’s worth mentioning at this point the heartbeat of the band, the two Garifuna drummers: Angel “Junior” Aparicio Martinez (Aurelio’s nephew) on the tambora segunda (the deep bass hand-drum) and Onan “Sambo” Castillo on the tambora primera (the higher pitched of the two). 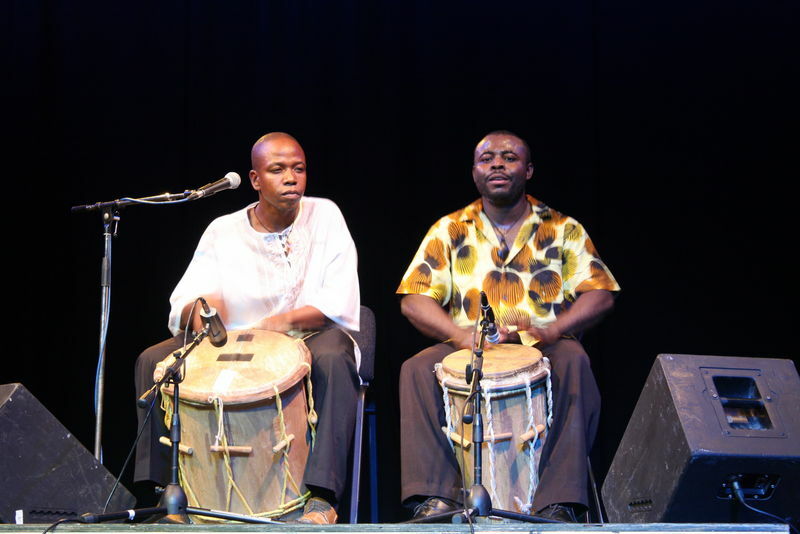 The Garifuna drums are cylindrical rope-tensioned hand-drums made of wood and animal skin. Their single-skin tops had two lengths of thin twined cord stretched across them and taped down, presumably to lend a certain buzz. These drums had a beautiful sound, the bass being particularly effective and penetrating and the primera having a presence and ‘cut’ halfway between a djembe and a snare drum. In the capable hands of Angel and Sambo these two were almost a band unto themselves. Aurelio then started to explain that Garifuna culture (the language, dance and music) is a recognised and protected culture by Unesco having been declared a “Masterpiece of the Oral and Intangible Heritage of Humanity” in 2001. He also touched upon the war between Mexico and US (1846-48 when the USA annexed large parts of its neighbour), about Bob Marley and the One World concept, and that the next tune was one about war and conflict; a song written and dedicated to George W Bush called “Tio Sam” (Uncle Sam). This was another driving rhythm and again I was struck by what a full sound they had for such a small band. Once again I was impressed by Guayo who utilised a surf guitar sound (think Pulp Fiction meets 3rd Rock from the Sun! ); maybe a little nod to the USA's annexation of California… Who knows? Or maybe he just listens to a lot of different music! "songs ... infused with conscious lyrics"
After the interval, the whole band seemed to visibly relax and really enjoy themselves, with many upbeat, catchy dance tunes (some seemingly taken at about a hundred miles per hour!) that got many of the audience dancing in front of their seats or up and down the steps. The band too took time during the numbers to show off their own dance skills, quite hilariously in some instances (Sambo Castillo’s belly being a big hit during one). But there was always a deeper meaning to the songs which were infused with conscious lyrics. We might not understand the Garifuna language but Aurelio tried his best to put the tunes in context. “Mayahuabá”, for instance was about a child who has lost his parents to HIV/AIDS) and featured wonderful drum and bass solos. "highly talented musician, conscious composer and passionate performer"
Other tracks included “Lumali Lumaniga” and “Yalifu”, in which Aurelio danced around the stage like a pelican) which was dedicated to his mother and to all mothers who have to stay behind to look after their families, whilst the menfolk go elsewhere to earn money which they might - or might not - send back home. He spoke about the breaking up of families in this way and the desire to be like a pelican and fly anywhere around the world at will to visit his parents. As they came back on for an encore Aurelio explained about his recent trip to Senegal to work, record and be mentored by Youssou Ndour and the effect that this had on him. It was his first time in Africa and it felt “like coming home”. He also spoke about the tremendous sadness of standing on Gorée Island, one of the main slave ports of West Africa, and the impact of this on him and it’s relevance to the story of the Garifuna. This set up the final offering entitled “Mama Africa”, a homage to the motherland - all about returning to Mama Africa. It had a beautiful melody (a bit like a Peter Sarstedt song: sad, but romantic) but with the tune set to afro rhythms, galloping along at breakneck speed and taking us all with it. A great end to a great show. Just need to mention the overall skill and musicality of the whole band (respect too to bassist, Emilio Alvarez, lovely stuff) and to a fantastic live sound in the theatre courtesy of their sound engineer Alejandro Colinas. 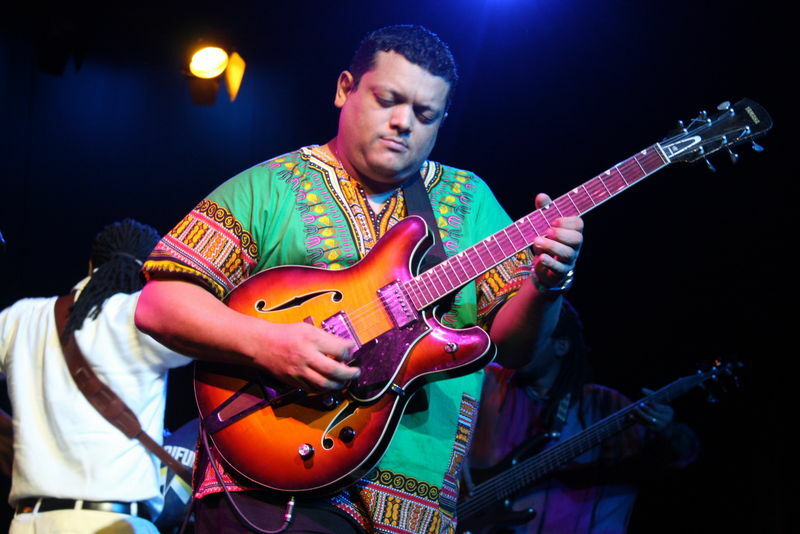 "If anyone is going to put the Garifuna culture onto the map, it’s Aurelio Martinez." If you get the chance, go and see this band. Aurelio is a highly talented musician, conscious composer and passionate performer with an excellent band behind him, as well as being the prime advocate for a unique culture. 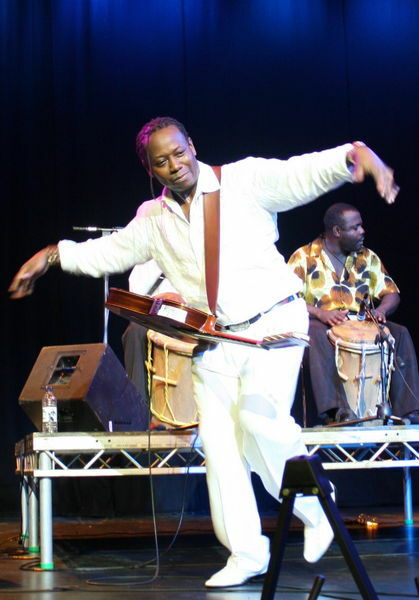 If anyone is going to put the Garifuna culture onto the map, it’s Aurelio Martinez.